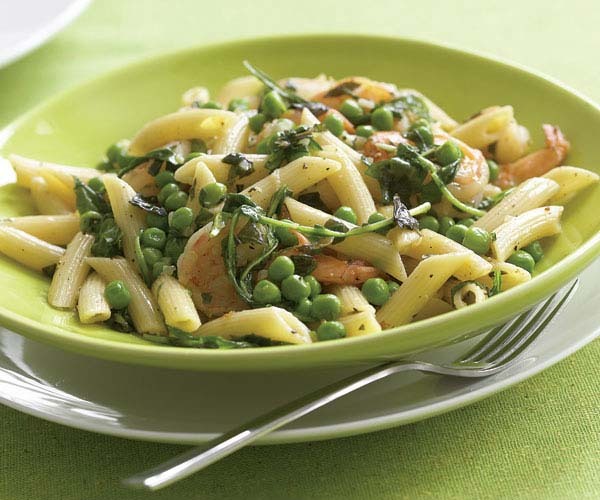 Not only do peas announce the arrival of spring, but they’re also sweet, tender, and take only a few minutes to cook, particularly when they’re very fresh and young, which makes them a perfect ingredient for fast weeknight dishes or busy weekend meals. We recommend penne for this dish, but you can use other short pastas like rigatoni or ziti if you like. Toss the shrimp with half of the basil, 2 Tbs. of the olive oil, and the lemon zest. Cover and refrigerate for about 30 minutes. Bring a large pot of well-salted water to a boil over high heat. 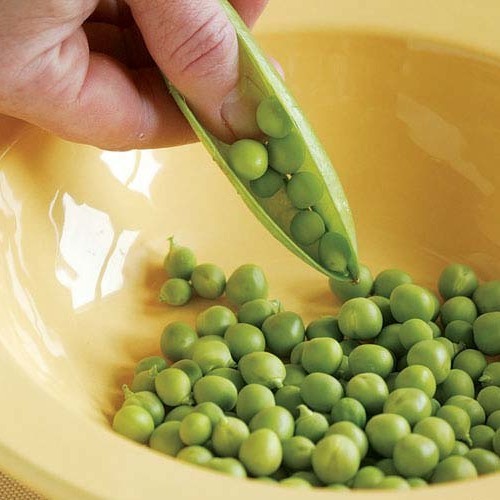 Put the peas in a large metal sieve and dip them into the boiling water. Cook until just tender, 2 to 4 minutes. Lift the sieve from the water, let the peas drain, and then spread them on a baking sheet in a single layer to cool. Add the pasta to the boiling water and cook, following the package directions, until al dente. Reserve 1/2 cup of the cooking water and drain the pasta. Meanwhile, take the shrimp out of the fridge and season them lightly with salt and pepper. Heat the remaining 3 Tbs. oil in a 12-inch skillet over medium heat. Add the shallots, garlic, chile, and a pinch of salt and cook, stirring occasionally, until the shallots are soft and lightly browned, about 2 minutes. Add the shrimp and continue to cook, stirring, until the shrimp have turned pink and are almost cooked through, 2 to 3 minutes. Stir in the peas and remove from the heat. Return the drained pasta to its pot and add the shrimp mixture and 2 Tbs. of the pasta water. Cook over medium heat until the shrimp are completely cooked through, about 1 minute more. Toss the arugula and the remaining basil into the pasta. Add more pasta water as necessary to keep the pasta moist and continue tossing until the arugula is wilted, about 1 minute. Season to taste with salt and pepper and serve immediately. Start off the meal with a Classic Caesar Salad. This dish was fine, but I felt the flavors and ingredients just didn't come together - they stood alone, without complementing. Easy enough to make and fresh tasting but not stellar. Great combination of seasonal ingredients! Love it with wild key west pink shrimpI also swapped spinach for arugula. And topped with a little Parmesan. Yum! My family loves this recipe. I make it as written. My two kids (5 and 7) cheer when they know this is for dinner. I agree it's not a "wow" recipe with big flavors, but the simple, delicate flavors are well-balanced and delicious. I make this about once a month but would make it more often if I kept shrimp on hand in the freezer (I use jumbo shrimp from costco and they work well).